Teishoku is about as Japanese as you can get for Japanese food. It’s a very traditional style of food that is simple, yet flavourful. It’s reasonable and fills you up. 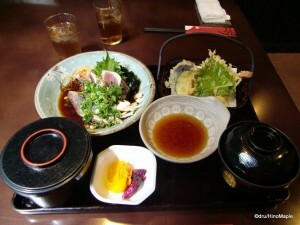 Essentially, teishoku is a set meal that is not unlike a “bento box”. A bento is actually something that can be thought of as an entirely different beast, akin to comparing the European and Asian pears. They may be of the same name, similar in many respects, but completely different when you eat them. A bento is similar to a packed lunch that you bring from home. They tend to have a small box of rice, and another box stuffed with various food items, such as meat, vegetables, and tofu. A grocery store or convenience store will sell bento, which is basically a take out version of teishoku. The basic definition of teishoku would be a set menu item. Generally, you get a bowl of rice, a main meat dish, which can be meat or fish, a bowl of soup, and one to two side dishes. The side dishes tend to be either tofu or some sort of pickled vegetable, usually tsukemono. Depending on the shop, the food is usually served on a tray from which you can enjoy everything. There are a variety of sauces that go on each dish, or you can eat things simply as is. The most common type of teishoku would be a basic grilled or broiled fish. This may not sound that delicious, but it is. It’s very simple, but the natural flavours of the fish are brought out during the grilling process, so there is no need to add anything. Usually, there is a small dish of grated daikon, from which you add a little soy sauce and eat it with the fish as a type of “sauce”. Other than that, there isn’t much to do. Thankfully, teishoku is not an expensive meal. 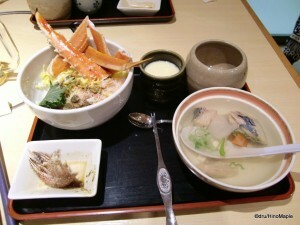 There are a few places to eat teishoku, but the most famous chain would have to be Ootoya. It’s a large relaxed style restaurant where you order more like a cafeteria. Generally, you order first then get a seat. Once seated, the food will come out sooner or later. There are several shops like this, and ordering at these shops can be a little difficult. Thankfully, most of them have signs where you can point and choose. Some shops will even offer free rice and soup as a service. When you order, you may think that the food itself is a little small and sparse. This can be further from the truth. I often end up stuffed with no room to spare for desert. If there is anything I recommend, I’d recommend avoiding any raw fish items. These shops generally don’t have the freshest fish in Tokyo. If you want raw fish, you should go to a sushi shop or a sushi donburi shop that specializes in raw fish. 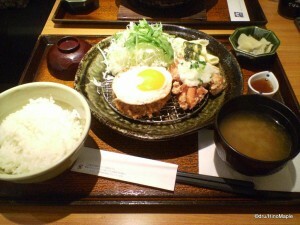 Getting tonkatsu, or other cooked foods is an excellent idea. If you are in an entertainment district during lunch, you can sometimes see an izakaya that has converted itself into a lunch time teishoku shop. These shops can be very interesting. You generally see office workers rushing in and out at all times. It’s not for the weak of heart as you need to be a little strong to understand how things work. Usually, everything is for a set price. You pay at the front then you can choose what you want to eat. They usually have a counter where you can pick one of the main items, then two of the side dishes. Water, rice, and soup are all self serve, but you can get as much as you want. The quality of the food tends to be good, but the quality of the rice will depend on the shop. Major izakaya chains probably won’t offer this service, and this service is usually open for just one or two hours a day. After the service has ended, the shop closes, cleans, and finishes preparing for the after work drinking crowd. It’s an amazing event to see and something I recommend trying if you aren’t afraid. Do be warned that the shop’s staffs tends to speak only Japanese, so getting help in understanding what to do can be very difficult. Just do your best. There really isn’t much to say about teishoku. It’s a very simple meal that exemplifies Japanese cuisine. It’s simple, yet delicious. If you are in Japan, this is probably the easiest type of dinner you can get every night. You can visit these shops daily and find new and interesting foods to eat for up to two weeks. It’s easy to get tired of it after a few days, at least for me, but changing the shop and changing the food will make it bearable. 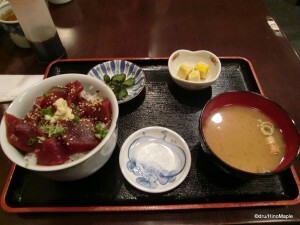 This entry was posted in Food and tagged bento, bento box, izakaya, japan, Japanese food, Ootoya, Teishoku by Dru. Bookmark the permalink. People kept telling me about Ootoya. Hmmm… I need to find the place and try when I’m there.